My history of heart problems goes back to 1985, when I had my first heart attack. 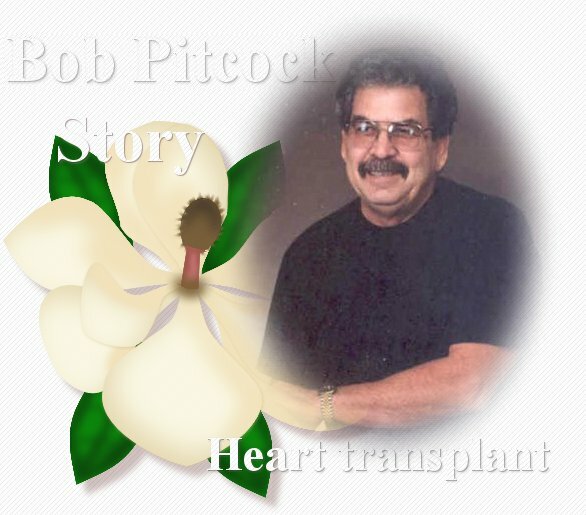 in 1986, I had my second heart attack, followed by heart bypass surgery (double bypass) in Dec. 1986 I went back to trucking on the road again. 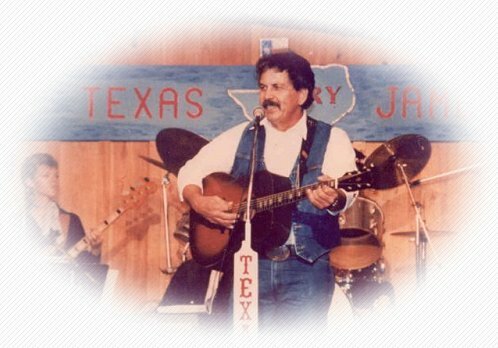 In Dec. 1988, while singing C/W music on stage at our local "Texas Opry Jamboree", I had another heart attack, right up on stage at microphone. I was rushed to hospital, got stabilized, spent 6 days in hospital, and went back to trucking again. Everything went fine for another 12 months. In Dec. of 1989, another heart attack. This one was a ‘whopper’. in the next few weeks, my cardiologist, Dr. Mandviwalla, suggested heart transplant. The previous attacks had weakened my heart so much; 40% of heart was damaged. I waited on the transplant list for 9 months before I got the call from my Transplant Coordinator at St. Luke’s Hospital here in Houston; she said “get your toothbrush and come on down, there’s a donor in Florida”. (My coordinator knew that I had a great sense of humor, that’s why she threw the toothbrush bit in our conversation). The following morning, I had 17 kinfolks and loved ones on hand at the hospital to support me with hugs and tears. I went into surgery at 4 AM that morning. Three hours later, I was in Intensive Recovery. I stayed in hospital 17 days, went home with my new heart, and have been feeling great ever since. I haven't had any rejection episodes whatsoever. One thing for sure, I have learned to smell the roses along the way and to be very thankful for my extended life. Sometimes, I really feel "Love" pouring out of every pore of my skin. I feel as though, someone stood back and poured a bucket of sweet honey all over me, by golly. It's such a great feeling! I do at times, think about my heart donor and his family in Florida. I really thank God for their compassion. My meds. consist of daily doses of 125 mg Neoral, 150 mg Imuran, 5 mg Prednisone, 1 Baby Aspirin. A stent was placed in my heart artery in 1998. everything has been fine since then. I go back each year for my post-transplant checkup. Since my first heart attack in 1985, I think that I've had around 25 Cath Tests up my groin. It's gotten so routine, that I just joke with my surgeon while he's doing his thing, while I watch that image on the monitor screen. For those who are interested, I have just returned home from my 2 day(outpatient) 14 year Post Transplant Checkup. (blood work, X-rays, EKG, Doppler, and Cath Test, checking for blockages in arteries around my heart. Every test turned out to be 100% positive. HOORAY !! I had a wonderful time, visiting with my former nurses and techs. A whole lot of "Neck Hugging" took place. My Cath Test showed no blockages, whatsoever......all of my numbers were on the up & up, and there was no changes in my medication. I have even lost 30 lbs. in the last 12 months, since my last checkup, a year ago, putting me at 235 lbs. at the present. My surgeon, Dr. Neil Strickman, gave me his email address, and asked me to send him some wondeful transplant stories, that I have discovered on the 'Net. I will surely do this from time to time. He was astonished, when I told him about Andrew Wilson's "Domino" transplant, because there are not too many of those performed worldwide. At the completion of my Cath Test, Dr. Strickman, closed my artery in my groin area, with the fairly new procedure (I don't know the technical name for it), but I only had to keep my right leg straight and rigid, for only 2 hours, then was permitted to check out and go home. The small bandage covering it, is only about the size of a silver dollar coin. Dr. Strickman told me that my 14 year heart transplant was wonderful. I presented my Transplant Coordinators, some of my Organ Donor tee-shirts. They were thrilled, by golly. It truly warmed my heart, to see the smiles on their faces. This picture below, was made 4 months ago. 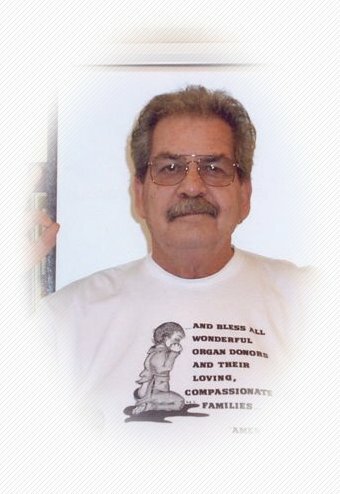 I created the shirt that I have on, to celebrate my 14 year heart transplant. I even sketched the pic. of the lit'l praying boy on the shirt.